My friend Ari sent us a bird feeder for Christmas. I knew the boys would love it, as our last bird-feeder didn't quite survive the summer. Being outside all the time, picked at by birds, is a hard life. 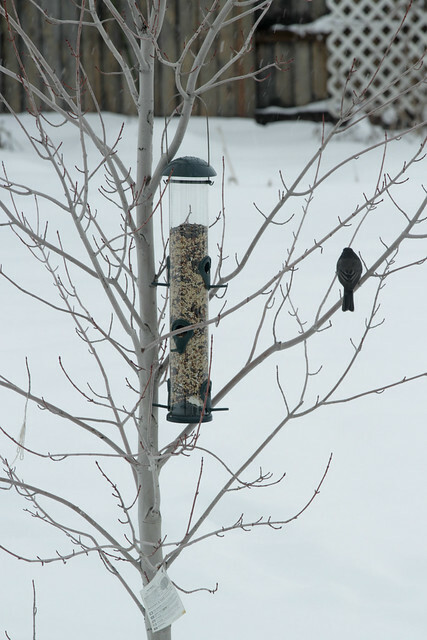 I finally got around to re-stocking bird seed and we got the feeder out and waited for birds to notice. Did they ever. It's been a rough winter to be a bird. So much snow sticking around for so long. I haven't seen my lawn since before Christmas. The birds have been more than eager to oblige us with their presence. And the boys love watching them. It's kind of nice to remember there's a whole world outside, even when it's too cold to go out and spend much time in it. (Add mom and her nursing baby and the opportunities to play outside get pretty unimpressive). So while we wait for all this stale, crusty snow to melt, and for Winter to thaw, we will birdwatch from the kitchen table.